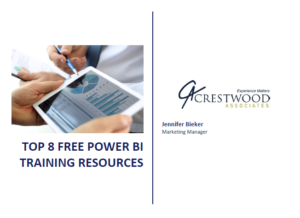 Whether you are a Power BI beginner or you’re ready to take your reports to the next level, you don’t want to miss out on Crestwood’s Top free Power BI training resources. We’ve uncovered the best resources and put them in one handy list. No matter how you learn, we’ve got you covered. Get links to guided learning, video training, and a free 189 page eBook from Microsoft.